In May 2013, I had a friend visiting me from Canada. He loves cars and he also loves anime. 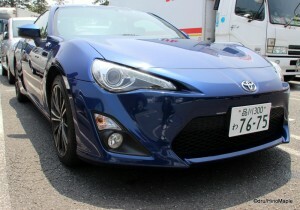 He had a dream to drive in Japan and see the countryside which was inspired partly by his love of the anime Initial D. He was content to rent any car possible, but decided to splurge and rented a Toyota 86, also known as a Toyota GT86 in Europe and a Scion FR-S in America. It was a 2+2 seater that was designed for sports driving. We picked up the car just after rush hour and had a lot of fun with it. Our destination for the day was Nikko. There was a twofold reason to head to Nikko. One was to allow his wife to enjoy the beautiful temples as she had never been. The other reason was to go to Irohazaka. I had mentioned Irohazaka before in my Nikko (Part II) post a few years ago. 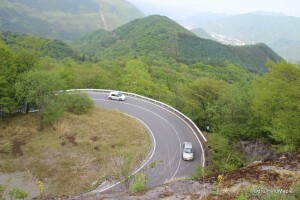 It is featured in Initial D, and it’s made up of several hairpin turns. It was fun but also a little scary when doing a little spirited driving. Irohazaka is located just past Nikko on route 120. If you are driving along the Nikko Toll Road, just go to the end of the toll road and you’ll be on route 120. Follow all of the signs to Chuzenji Lake and you’ll be fine. 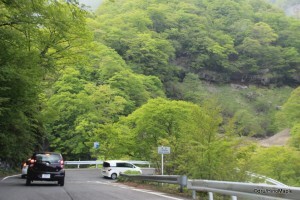 Many people will go up Irohazaka by bus to get to Chuzenji Lake as it is a famous tourist spot known for the lake itself as well as Kegon Falls. The area at the top of the mountain pass is very beautiful and I’d love to explore the area a lot more, but due to time constraints it was difficult to do any exploring on foot at that time. 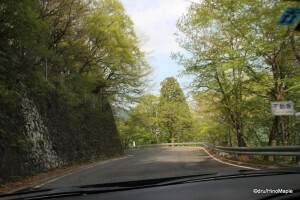 Irohazaka is appropriately named due to the number of hairpin corners leading up to Chuzenji. Today, Irohazaka is split into two sections, up and down. Due to the problems with crowding on the road, they had to split the road and build a new uphill section. The original was modified from the original 48 corners in 1954 so the original Irohazaka, now the downhill section, only has 30 corners. The name Irohazaka comes from the word Iroha, which is the old name and method of saying the alphabet in Japanese. Today, they changed the order but the route is still appropriately named Irohazaka. While the downhill route is the original Irohazaka, the uphill route defines Irohazaka more appropriately. The uphill route was originally built with 50 curves but it was later modified to match the historical 48 curves for tourism needs. The uphill section of Irohazaka is probably the most “dangerous” as the road has two lanes and lots of cars go racing up the mountain. At most of the hairpin corners, you can see people who made light skid marks as they entered the corner very quickly. Most of them look planned as there were no skid marks leading off the edge of the road. The corners themselves are not for the weak. If you are a spirited driver, it is very easy to make mistakes as many of the corners are decreasing radius corners with a few increasing radius corners. It is difficult to know where the true apex of the corner is on your first “run”, let alone your third run. Having a GPS navigation system in the car helped a lot so that I could help my friend understand the corners better. The uphill section also has “speed bumps”. If you have ever played the Initial D video game, especially in an arcade, you will notice that you go over painted sections of tarmac that is bumpy. These are designed to prevent people from racing up and down the mountain. While it is effective to a limited extent, it won’t prevent people from doing whatever they want within the limits of their machinery. Going downhill is a very different beast. While many people may say that going downhill is more dangerous than uphill, on Irohazaka, this is not really true. The main reason for this is that there are so many vehicles going up and down the mountain that you will be stuck in traffic. When going uphill, there are two lanes so it isn’t difficult to pass people. You do have to be careful when passing, but it isn’t impossible. When going downhill, there is only 1 lane so passing is impossible. It isn’t hard to be “stuck” behind a slow moving vehicle, but this is better as going downhill is pretty dangerous. The hairpins going downhill are pretty sharp and steep. The best way to think of it is to imagine going down the famous Lombard Street in San Francisco. While the straights are a little longer, the hairpins can feel just as tight. I do recommend going slower downhill, although it is a lot easier to see the complete corner compared to going uphill. Irohazaka has the infamous reputation of being a racer’s paradise. While I don’t particularly enjoy racing up and down the mountain, it is still a beautiful road. It is extremely famous in the autumn season when all of the leaves change colours. 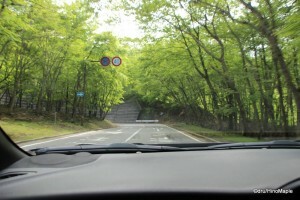 It is the worst time to try to enjoy driving, but it is the best time to enjoy nature. I have heard of traffic jams heading both up and down the mountain and the inability to keep moving. I heard it can be similar to rush hour traffic on any other highway. On weekdays, and probably at night, the traffic is relatively light. Weekends do see a jump in traffic but I doubt it is to an extent that you couldn’t enjoy a pleasant drive. They do a lot to prevent people from going up and down the mountain often. There are large curbs in the centre of the road at the bottom of the course and you have to drive at least 1km out of the way to turn around legally. It isn’t impossible to do a U-turn, but be warned that the police could be sitting and waiting for you to do something stupid. If you do drive up and down the road, be sure to enjoy it as the views are also wonderful. This entry was posted in Automobiles, Kanto and tagged 48, 86, anime, Chuzenji, Chuzenji Lake, Drive Japan, driving in Japan, FR-S, FR86, FRS, GT86, Initial D, Iroha, Irohazaka, japan, Kegon Falls, Nikko, racing, Route 120, Scion FR-S, Scion FRS, Toyota 86, Toyota GT86, Zaka by Dru. Bookmark the permalink. How did your friend deal with the “driving on the left” part? I found it quite confusing when I was in New Zealand (and I didn’t try any driving while fisiting Japan). My friend did well. I was with him and making sure he didn’t turn down the wrong side. He only once went on the wrong side. We turned left and he instinctively went into the wrong side. I immediately told him and he quickly corrected. He would have been fine without my notes either way but it was his only mistake.